Perfect for our 2-year-old grandson who is really into trucks! He received 3 types of Dump Truck to play with in the dirt/grass or inside for Christmas. I was pleased and surprised when I received this ornament. It is very nice. I didn't pay much for this ornament and was expecting a low quailty item, but it was very heavy,(not plastic)and the letters was clear and printed nicely. Perfect ornament for my son's second Christmas. We got a similar style ornament for his first Christmas, a choo-choo train and hope to be able to continue the tradition each year! 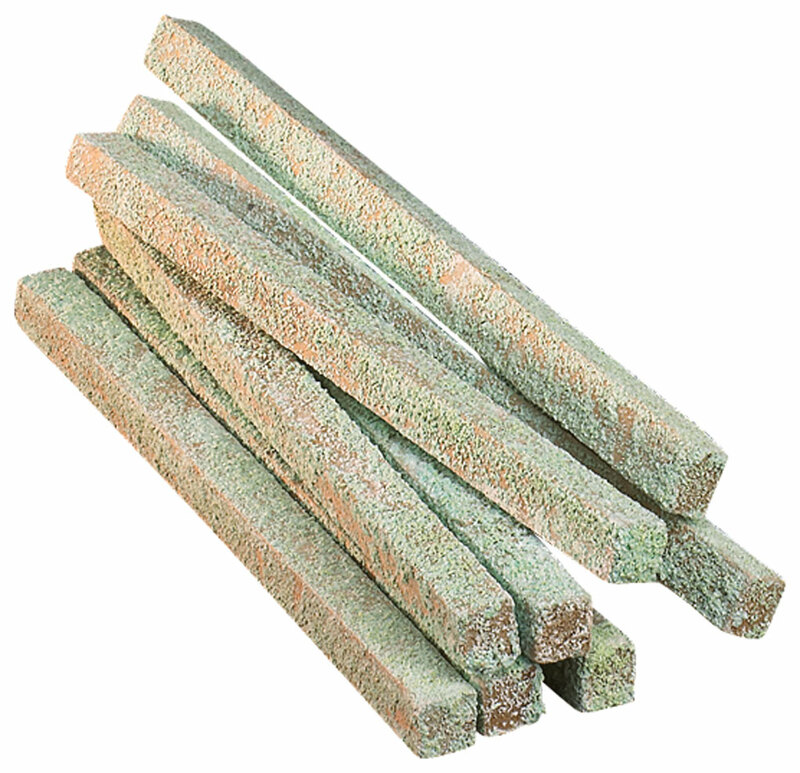 Not cheaply made - very sturdy! Bought it as a Christmas ornament! My nephew loved it !!! I bought this for my 10 yr old nephew Lane. He loves any kind of cars and trucks. His face lit up when he opened up his package. He was so excited to receive it. I bought this for my grandson. Really adorable ornament, bright colors. My grandsons love dump truck and trucks. This ornament was so perfect for them to hang on their tree. They really liked them. They each had their names on them so they knew which one was for them. No arguing over whose was whose. Good for a kid that loves trucks! Love to add an ornament each year for my grandson, this was his 3rd Christmas addition. I love it, love the date and name on it and I know my grandson will love it. Keep these ideas coming. Also purchased the pirate's ship for my other grandson and can't wait to give it to him. As for the dictionary, it is nice with the large print. Keep the magazines coming. Enjoy finding ornaments each year that "fit" what my grandchildren are "into" each year. My three year old nephew is really into dump trucks, so this was a big hit for him. He wows also excited to see his name on his own dump truck! This ornament is so attractive. The colors are clear and bright, and the truck seems very durable. The lettering was also very clear. This will surely please my little grandson when he sees it. Perfect for a child's tree ornament! Ordered for my grandson who loves trucks. Very nice ornament. My grandson loves trucks so this was perfect and very colorful. it's so precious. My great nephew loved it. The dump truck really is precious. Very good quality. I would refer my friends and I will order again. Got for my Grandson for Christmas, third year I have ordered ornaments, have been very pleased with all. Attractive, bright colors and made with heavy material to last. Great ornament. My grandson will be thrilled & he can handle it without the fear of breaking it. Merry Christmas to all! The personalization was so well written, very neat! My grandson absolutely loved the ornament. It will be a family treasure in the upcoming years. This was really easy to order on line. The ornament is darling and delivery was really fast. GOOD JOB!! Great size and really cute! 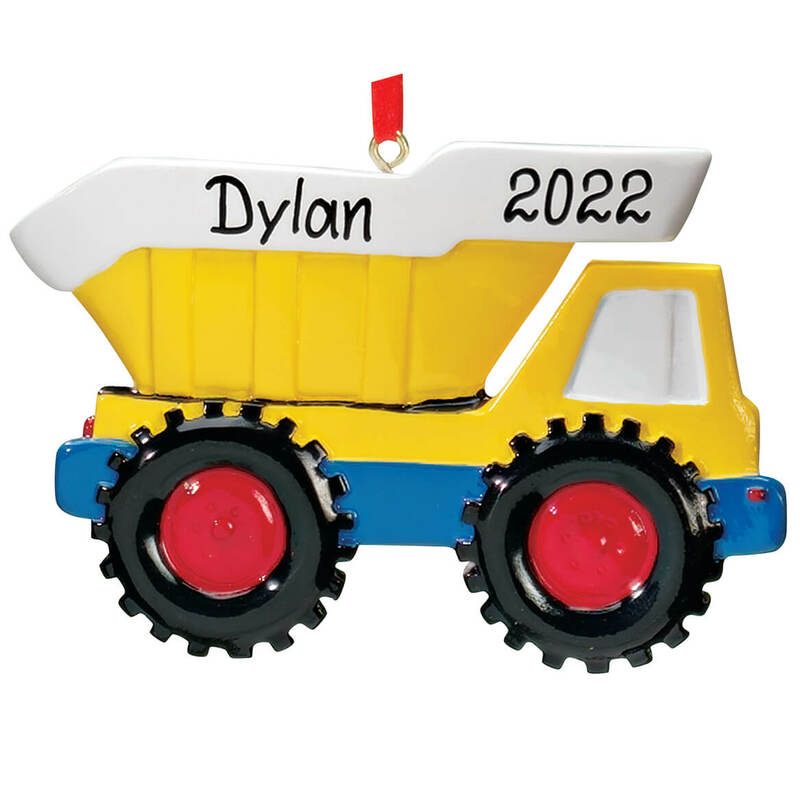 I ordered the dump truck for my Christmas tree with my young grandson's name, birth month and year. It is so colorful and cute and a great size for my tree. I ordered it late and was worried that it wouldn't come in time but to my surprise it came! Love it! I buy one every year!! I gave it to my grandson to hang on his tree. My grandson is into trucks and he loved this ornament, especially seeing his name printed on it. This item was very cute. Our grandsons love these ornaments. They have their own small trees and enjoy decorating them. These ornaments are bright and fun. My grandson is 3 and loves trucks. This ornament was nicely done. It is a perfect for my grandson. Nicely made and a cute gift. It's a great gift. I would advise that even though the illustration shows the year on the dump truck it is not there unless you order it! I got it for my grandson and his name is on it but not 2011 because I thought it came that way due to the catalog and online pictures. Every year for Christmas I choose a theme of something my grandson is really interested in. This year, he's been all about his trucks ; I was pleased to find this ornament & really pleased I was able to get it personalized ?? Very nice, but did not have the year on it. This is a quality Christmas ornament!!! Lettering is nicely done, and I was pleased that it is ceramic!! I am not disappointed!! Item in book showed year, but when I went to have it personalized, it would not allow it. Wish I could have had the year. The ornaments that are pictured are metal, when I received them they are made of a breakable material. I buy my grandkids a new personalized ornament each year and put them on a small Christmas tree in our house. It's fun to see the growing collection which represents their interests at each age. 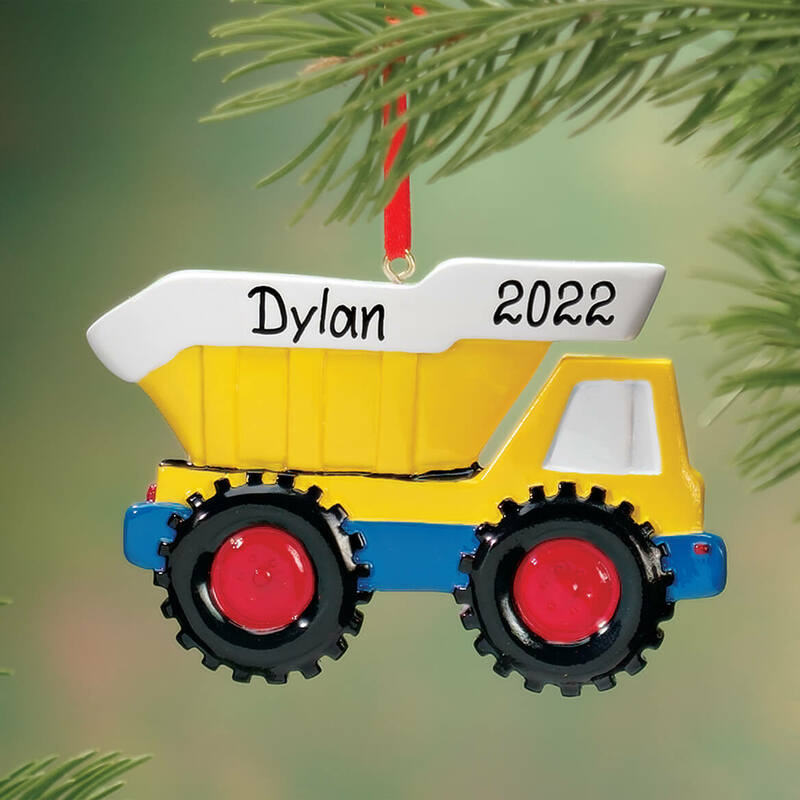 A very sweet little boy loves dump trucks and I know he will grab this off the Christmas tree as soon as he sees it. The one I originally ordered was out of stock. My grandson loves trucks and I like that it could be personalized with his name and the date. I give my grandchildren an ornament every year that depicts something important to them for that year. The little boy for whom I purchased this loves trucks. My son is obsessed with anything "worker man" related! This will be perfect for him. I like being able to personalize the items. Great grandson that loves anything with wheels. Grandson is 4 and loves trucks! Because my grandson loves trucks. My friend's son loves trucks and this one got the best reviews. I thought it would be a nice stocking stuffer for Christmas. I buy a personalized ornament for my grandson each year based on what his "interests" are. 2016 he was all about construction equipment! For my great grandson, who loves trucks. Our tree is decorated with ornaments with everyone's name on them each year so we are keeping with the tradition and adding our grandson. BEST ANSWER: HI, my name is Chris and i just want to say i have ordered all my Christmas ornaments from Miles Kimball this year. I coulo not be happier with my ornaments. I buy ornaments every year for my family some with the names but they all have the year. I usually buy them at the mall, but I found out this year that they have a much better selection. I will from no will only from Miles Kimball. The color is like a John Deere green but nothing on the ornament says " John Deere"
I think but ask Miles Kimball. The dump Truck is not a John Deere Tractor it is a dump truck. The tractor really isn't a John Deere either but for a child it's close enough. Yes the ornament does resemble a John Deere tractor. It is very cute. I hope this helps you. Happy Holidays! I'm not sure what the question is. I'd be happy to help if I knew what the question is. The tractor is a nice bright green; but does not have the John Deere name or logo. Tractor is green but nowhere on the tractor does it say "john deere". I didn't buy a tractor. I bought a train and a dump truck. It doesn't say John Deere on it, but it's a good replica. Very happy with the Tractor Ornament. I recommend it.